Welcome to Rennhack Orchards (Farm) Market! Get your locally-grown farm-fresh produce at Rennhack Orchards Farm Market in Hart, where we grow it for you and do gift baskets, too! 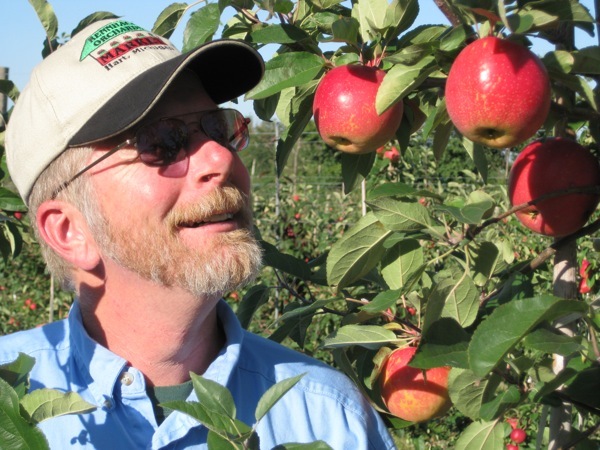 We grow a large variety of fruits and vegetables right here on our family farm in Oceana County. We also specialize in local and Michigan-made gift items and foods of high quality, including locally made organic breakfast cookies, honey, maple syrup, and maple-coated nuts, pies, tarts, and strudel, freezer jam, and Country Dairy milk, cheese, and ice cream. Our own Golden Delicious Apples! Our own Ida Red Apples! Handmade Frozen Pies to bake at home! Local Honey & Maple Syrup! Local & Michigan-made Gifts & Gift Baskets! Please stop by or call our market at 231-873-7523 (during open hours) to find your favorite in-season produce, or check our Facebook page to see more about what we currently have available. Shipped Gift Baskets can be ordered June through December 13 by visiting or phoning the market, or by emailing us through our contact form. We can also ship your favorite pantry items if we have them in stock. If it is the off-season, email us with your request, and please be patient! Our farm market is located in Oceana County on Polk Rd in Hart, halfway between US 31 and downtown. Shop in a friendly atmosphere where extended browsing is encouraged, and be sure to try our samples for a taste of the season. In addition to our fresh produce, you will also find an interesting assortment of local and Michigan-made jams and other pantry items, gift baskets and unique gift items, and a whole lot more. You may want to take a walk or a bicycle ride on the Hart-to-Montague bicycle trail (Michigan’s first rails-to-trails bicycle trail); the trailhead is just across the road from the market, and the trail has been newly repaved. It’s a great outing for couples and families! Here on our market website, you can keep up to date on what’s in season here in Oceana County, and find interesting tips about taking care of your produce at home. And don’t forget to browse our own recipe collection for some great ideas on preparing special dishes using our farm-fresh produce. If you would like to receive our latest news right to your inbox, subscribe to our e-newsletter. We do accept phone orders and would be happy to answer any questions that you might have. If you would like information or are looking for a specific gift item, just give us a call during business hours at (231)-873-7523, or contact us through our website anytime.